While claiming that the International Monetary Fund (IMF) remains ready to support Sri Lanka, its Managing Director Christine Lagarde said that an IMF team is scheduled to visit Colombo in mid-February to resume program discussions. Christine Lagarde, on Tuesday, met with visiting Finance Minister Mangala Samaraweera and Governor Indrajit Coomaraswamy, in Washington DC. “I was pleased to meet with Minister Samaraweera and Governor Coomaraswamy this afternoon. We discussed the challenging economic environment and the policy priorities for the country. 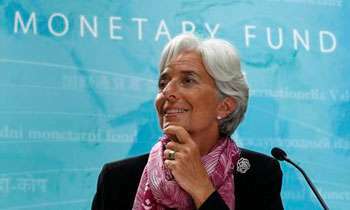 The authorities stressed Sri Lanka’s continued commitment to their economic reform agenda under the IMF-supported program,” Lagarde said in a statement after the meeting. “We agreed that a strong policy mix, with effective implementation of that agenda, is key to strengthening confidence while putting Sri Lanka on a sustainable, high-quality growth path that would benefit its people,” the statement added. IMF SHOULD BE AWARE OF THE WASTED PROJECTS UNDERTAKEN IN SL SO FAR. UNLESS THE ETHNIC PROBLEMS ARE SOLVED IMF SHOULD HAVE STRICT CONTROL ON SL LOANS. We only need a little sum of money and not a grand sum carried by a teams from IMF.